According to the Wikipedia article on BUPA, (short for “Britsh United Provident Association,”) it had 84,000 employees in 2016. We don’t know whether it has more or less in 2019, suffice it to say, that it is a very large international healthcare organisation. 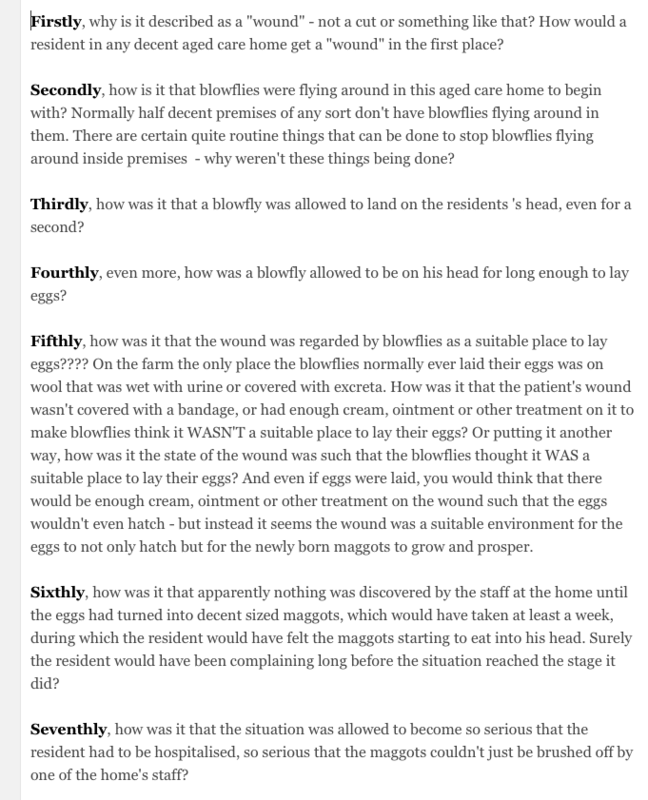 It appears that the aged care home at Eden was family owned until it was bought by BUPA, and that while it was under BUPA’s ownership, according to an article in the Sydney Morning Herald, (where would we be without the journalists?) maggots grew in a “wound” in the head of one of it’s residents to the point where he had to be taken to hospital – it appears the maggots had started eating into his head, which is what maggots do, so that the situation had got beyond the stage at where the maggots could just be brushed off. In relation to this, BUPA was sent the email shown below on 14 Mar. 2016 – i.e. 6 days ago, for their information and comment. This response was received straight away. Four business days have passed since and nothing. And the home at Eden has been similarly contacted and nothing from them either. This is all about ACCOUNTABILITY. 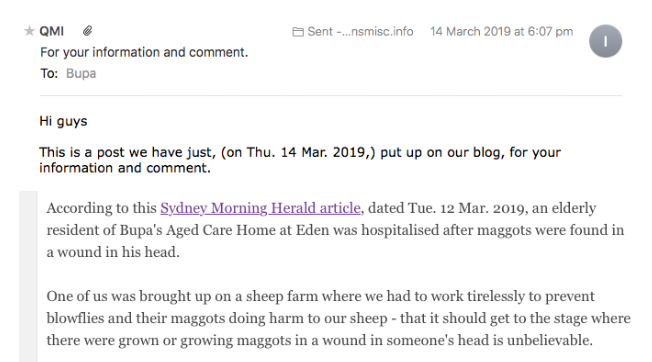 Ideally the response from Bupa’s top management should have been along the lines of, “We’ll get in touch with our people at Eden to get their side of the story and get back to you.” But there’s absolutely no indication that anything like this is happening. And when you find you’re dealing with an organisation in which the people “on the ground” don’t care, and the people at the top don’t care that the people “on the ground” don’t care, you’re in a lot of trouble. We’ll keep you advised of any further developments.